Dog Owner Jill Karnicki poses with Ginger, the 14-year-old dog she adopted during the 2017 Clear The Shelters event in Houston, Texas. Ginger remained at the facility for 51 days before Karnicki adopted her. Ginger didn’t have trouble adjusting to life with Karnicki’s two coton de tulears. Shelter visitors often lean toward adopting puppies. Jill Karnicki was watching local news on a Saturday morning when she first learned about Ginger, a 14-year-old shepherd mix. Each week, the Houston Society for the Prevention of Cruelty to Animals brings an adoptable pet to a local TV station to highlight as the “Pet of the Week.” The group brought Ginger with the hope of finding the older pet a home. Karnicki already cared for two other dogs and had only been tempted to look for a shelter pet once before, but Ginger’s age struck her. After watching the segment, Karnicki waited five hours before making a trip to the shelter, providing other viewers with the chance to adopt Ginger. With Ginger still available, Karnicki arrived at the Houston facility and immediately took note of the dog’s loving personality. 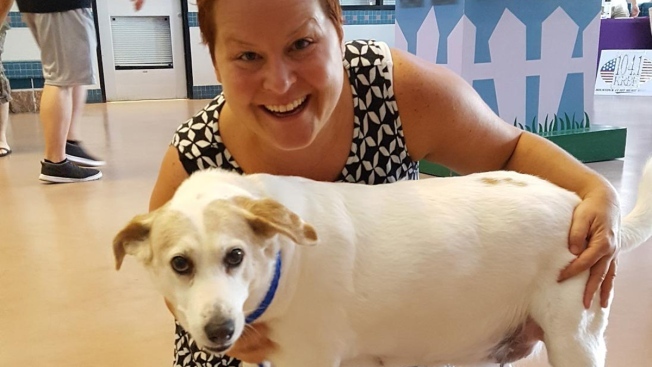 Within five minutes, Karnicki decided she wouldn’t leave without Ginger, who was the first dog at the facility to be adopted during last summer’s Clear The Shelters event. Ginger’s previous owner dropped her off at the shelter because the family had too many animals, Houston SPCA spokeswoman Julie Kuenstle told NBC. She remained at the facility for 51 days before Karnicki adopted her. Ginger didn’t have trouble adjusting to life with Karnicki’s two 10-year-old coton de tulears. The three dogs hover around Karnicki when they take trips to the dog park and enjoy excursions in Galveston, Texas, where they roam the beach. Karnicki purchased the dogs life jackets, but none of the three like to swim, she said. Growing up, Karnicki and her family were often asked to care for stray dogs that others found but had never adopted a shelter pet. She was pleased with the process and admired the fact that all of Ginger’s medical needs were tended to before she left the shelter. Kuenstle said Ginger was overlooked several times because of her age. Instead, shelter visitors leaned toward adopting puppies. However, senior dogs could be ideal because they’re often already trained and still have energy and a desire to play, Kuenstle said. After Ginger was adopted, a picture of Karnicki and the newest member of her family was displayed on the broadcast the following week, celebrating the uncommon adoption of an older pet.